After seven years in space, Cassini went into orbit around Saturn on July 1, 2004. 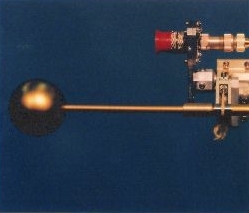 Since then, have have used our Langmuir probe instrument onboard for investigating the space physics of the Saturn system, including its rings and moons, particularly Titan and Enceladus. The Langmuir probe is designed and built by us at the Swedish Institute of Space Physics in Uppsala, and we get a lot of nice data and results. Our Langmuir probe on Cassini. Live data being received from our RPWS LP instrument on the Cassini spacecraft. The Cassini/Huygens mission to the Saturnian system is jointly managed by NASA and ESA. The spacecraft was launched in October 1997, and arrived at Saturn during the summer of 2004. The Huygens probe landed on the planet-sized moon Titan during January 2005. The sensors on Cassini have sampled exciting data from the planet Saturn itself, the space and radiation environment, the icy moons and rings, and in particular Titan. The measurements around Titan partly aim to make discoveries that may unravel some of the processes that have led to the origin of life on Earth. For further information, see http://www.esa.int/SPECIALS/Cassini-Huygens. The Cassini project has been extended until 2017, when the spacecraft will finally impact the clouds of Saturn. The mission plan now includes several flybys of the ionosphere of Saturn inside the innermost D-ring and several crossings of the exhaust plumes of the moon Enceladus. The approved schedule includes 127 flybys through the ionosphere and upper atmosphere of Titan. Several close flybys have also occurred past several of the interesting icy moons (e.g., Enceladus, Dione, Rhea, and Iapetus). There have also been numerous crossings through the plasma in the E-ring. So, what is this Langmuir probe instrument that we fly on Cassini? When used in space, A Langmuir probe can be seen as a kind of "cosmic weather station", that can be used to study the very tenuous gas of charged particles that we normally find in space. Hey, what, isn't space a vacuum? Well, compared to the air around us on Earth, it is, but the vacuum is not perfect: essentially everywhere, there is a tenuous gas of charged particles. Such a gas of free ions and electrons is called a plasma. The basic principle for measuring this plasma with a Langmuir probe is simple: put a sphere (the probe) on some sort of boom on your spacecraft, apply a positive potential to the probe, and measure the current that flows from the spacecraft to the probe. As we put the probe at a positive potential, the current is due to collection of free electrons from the plasma. The higher the current, the more free electrons there must be around. Voila, we have measured the density! By some more intricate means, we can get the temperature as well, and sometimes also the plasma flow speed, i.e. the "wind speed", and the mean ion mass. Hence, we have a weather station in space, observing about the same things that Earthbound weather observatories do: temperature, wind speed, and pressure (which essentially is density times temperature). Simple as this principle may sound, there are of course a lot of difficulties. Constructing electronics for low-noise measurments of currents down below the nanoamp level is a challenge in itself, and in addition there are a lot of factors complicating the elegant principle above. We have have long experience of building this kind of instruments for many spacecraft (see our group home page). Still, the design and construction of the Langmuir probe instrument spanned some eight years from first conception to final launch! Above the photo at right shows our Langmuir probe on Cassini, goldish because its surface layer of titanium nitride. OK, but what are we doing, now that we have spent so much time on building this instrument? Our main scientific interests are the tenuous plasmas found around Saturn and in the upper atmosphere of the moon Titan (see above for what a plasma is). Saturn's magnetosphere is a gigantic object, due to the strong magnetic field from the planet and the low pressure from the solar wind. It spans all of the ring system and most of the moons. This magnetosphere is in some ways similar to the magnetosphere of the Earth, but in other respects different. To learn exactly where they differ and where they look the same is important: this can tell us something about what we can expect around other magnetized objects in space. For us, the distribution of plasma in the Saturnian magnetosphere is one of the most interseting things. We collected very nice data already at the first ring plane crossing: the interaction of the ring material with the plasma is of course one thing we want to dwell further on. We have also mapped the plasma density in all parts of the magnetosphere visited by Cassini. Titan's ionosphere, i.e. its uppermost, ionized, atmospheric layers, is a fascinating place. Titan's atmosphere has a complex organic chemistry, with the possibility for complicated reactions, perhaps creating large organic molecules, in the plasma layers at top of the atmosphere. From the first flybys, we learned that Titan's ionosphere is eroding at a rate of around a kilogram per second (paper in Science, May 13, 2005), and we continue digging out lots of other fun stuff from the data. We list some of these on our main team website. Learn more about Cassini's investigations of Saturn's magnetosphere and Titan at the JPL Cassini web site. The Radio and Plasma Wave Science (RPWS) instruments onboard the Cassini spacecraft consists of three electric antennas, a three-axis magnetic search coil and a Langmuir probe for monitoring the thermal plasma. Our group has delivered hardware (a spherical TiN-coated Langmuir probe, receiver electronics, and a deployable boom) as well as software for the Langmuir probe and for allowing the use of two of the RPWS electric antennas to study the plasma flow velocity. Our Langmuir probe provides measurements of several basic physical parameters of utmost importance for the processes occurring in the magnetosphere of Saturn. Among those are the plasma density, electron temperature, ion speed, solar UV intensity, spacecraft potential, and characteristics of small-scale plasma density structures up to 3.5 kHz. The Langmuir probe has been operated almost continuously since arrival at Saturn in July 2004. Our science objectives are related primarily to data from the Langmuir probe, and from the electric and magnetic sensor signals provided by the 5-channel waveform receiver operating up to 7 kHz. We have to date a huge database of plasma waves and low energy plasma from the Saturn system. RPWS has provided very nice data: for example, you can listen to the sounds heard by RPWS around Saturn.